Raven Queen, daughter of the Evil Queen, tries to magically reverse her mother's curse on Wonderland and accidentally transports herself and her friends to Wonderland High. 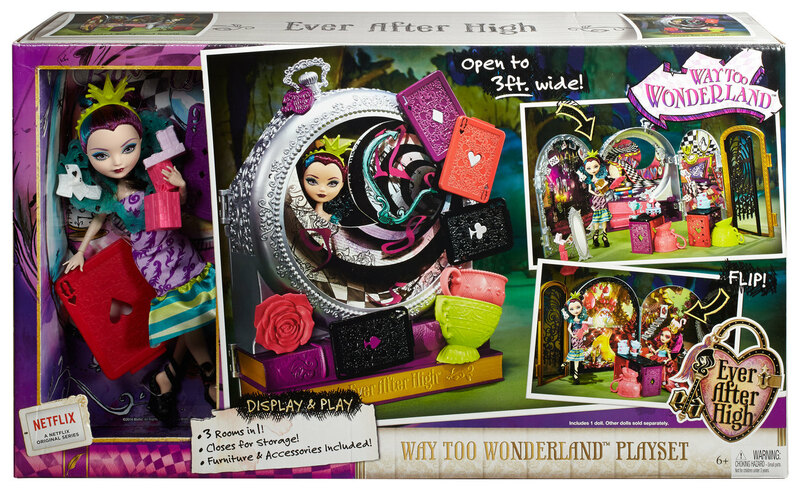 Girls can control the story with this Wonderland-iful display set that opens to reveal three rooms. Closed, it's a wicked cool, giant, silvery pocket watch decorated with bright colors, teacups and playing cards. 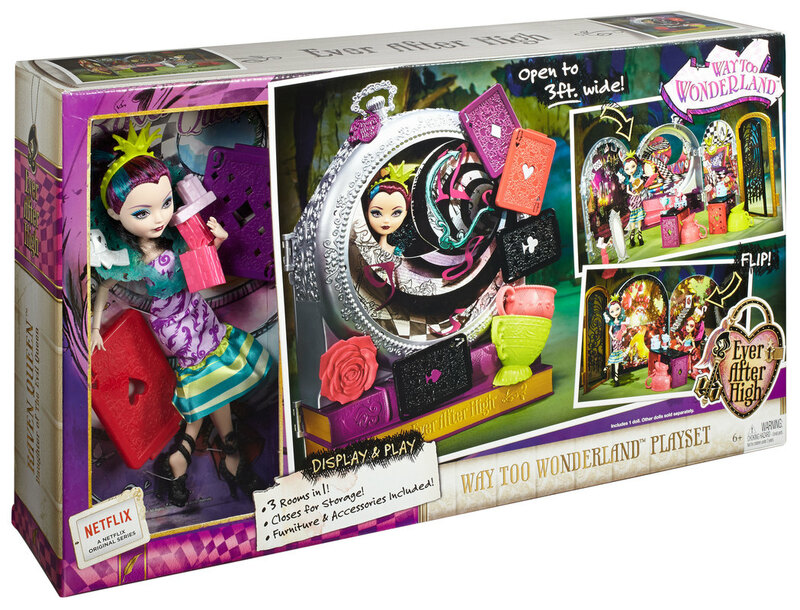 Raven Queen doll is wearing her spelltacular Wonderland dress. 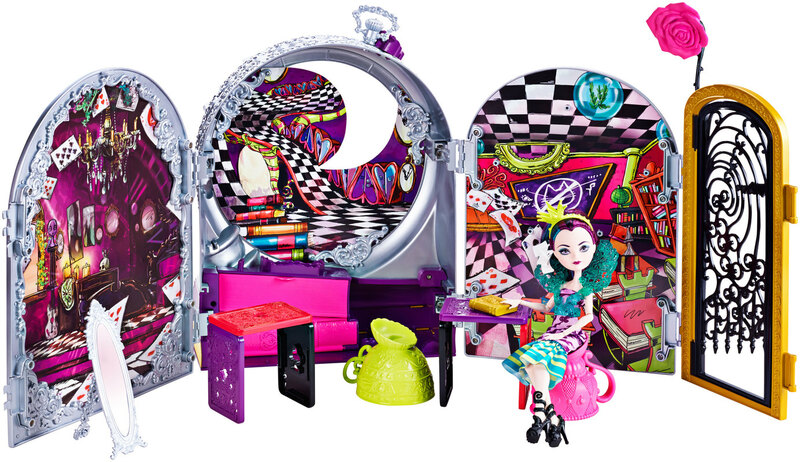 Open and unfold to play and display Raven Queen doll in one of three scenes: her dorm room, Wonderland High and the Queen of Hearts' birthday party at the Wonderland Card Castle. 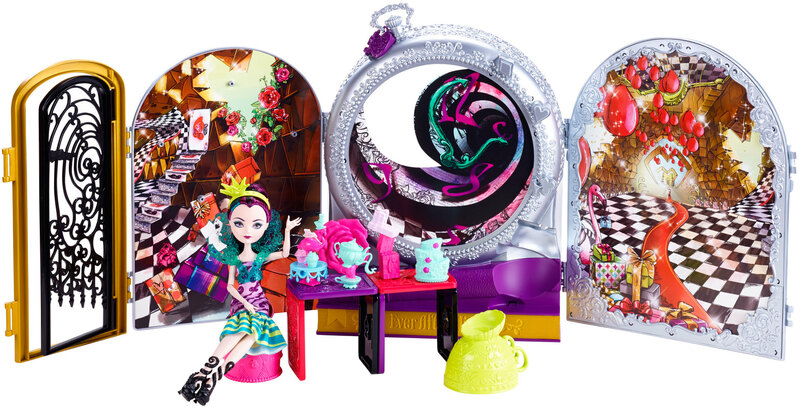 Girls can arrange the room walls to suit their story and use the included oversized playing cards and teacups (that work as chairs) to build furniture and customize the space. Pegs are perfect for holding themed pieces. 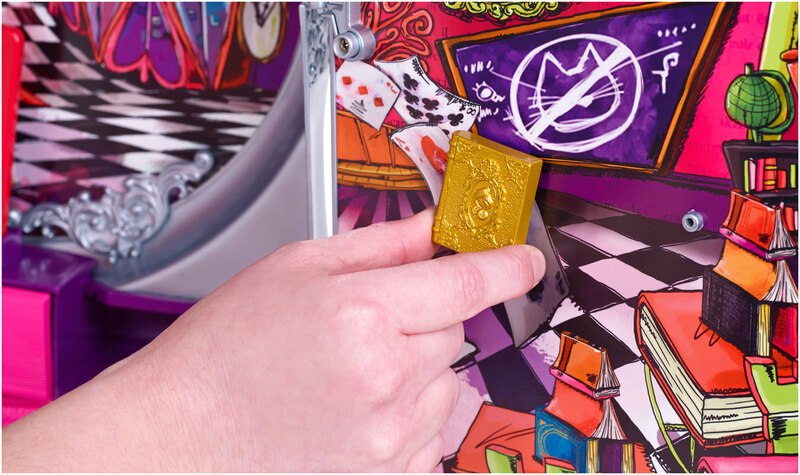 Fabulous accessories include party pieces, like a birthday cake, presents and flamingo treat tray; decorative items, such as a rose chandelier and a magic mirror; and storytelling accessories, like a doll-sized Storybook of Legends. 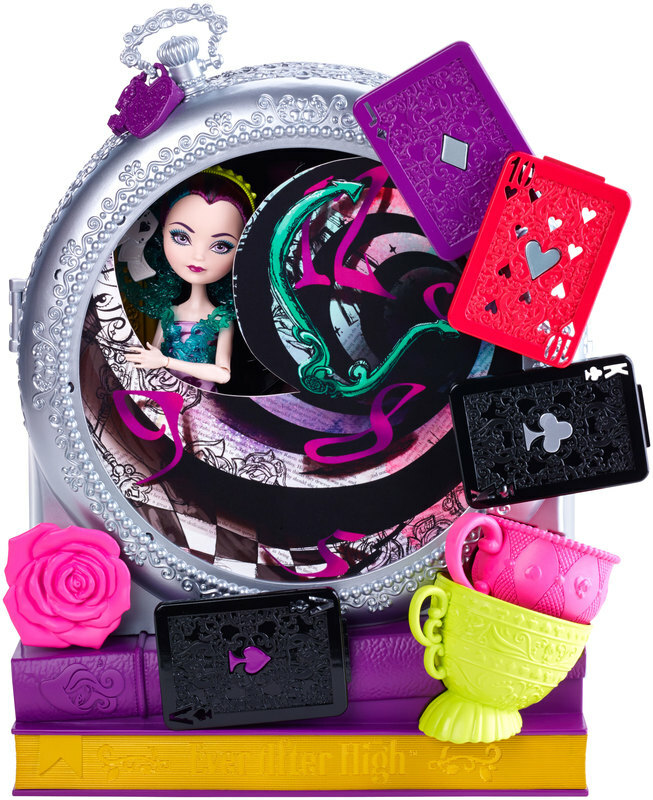 When done playing with the set, all pieces can be cleverly stored and the clock folds up for exquisite display. Raven Queen doll is spellbinding wearing a Wonderland-iful dress with bold neons, beautiful pastels and graphic prints. 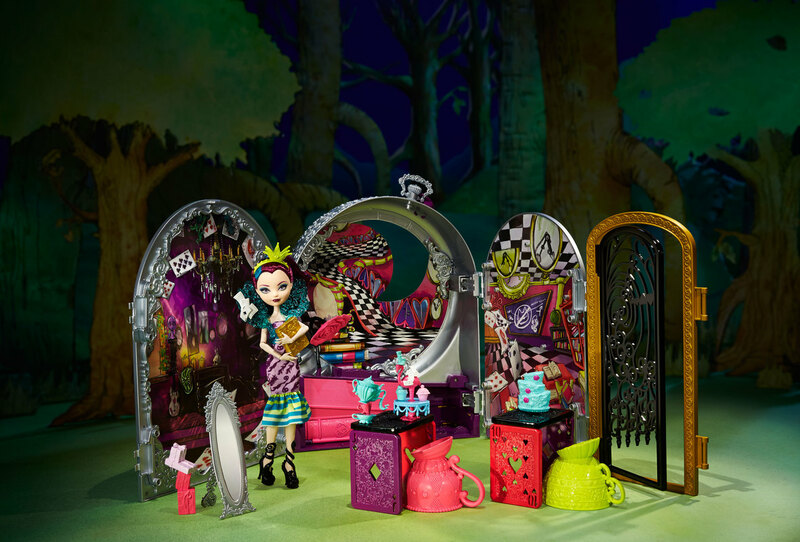 A exquisite oversized collar with playing card details, spelltacular black shoes and a headband with crown are "just right" accessories for Wonderland. 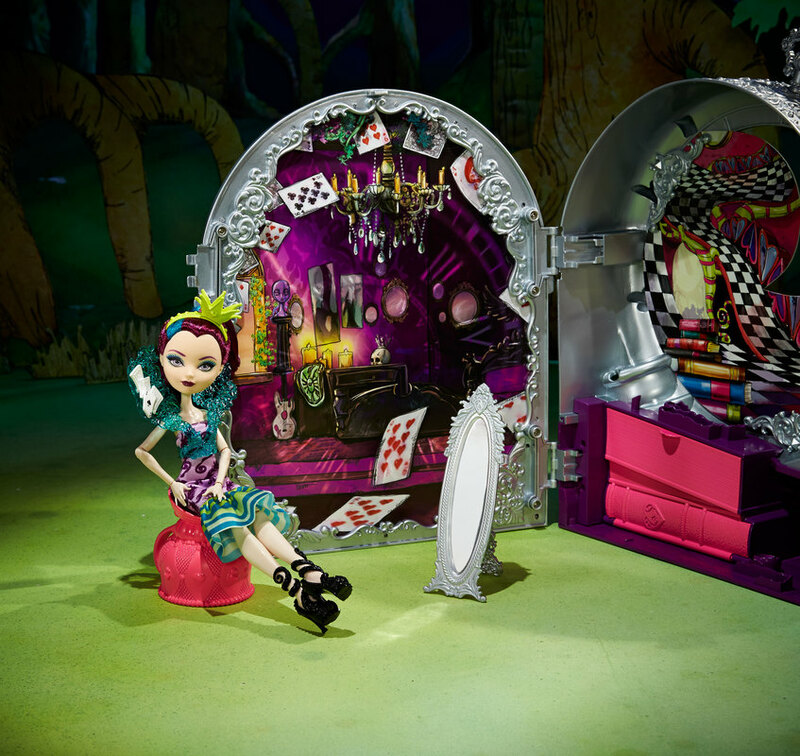 Use the doll stand to capture the possible doll in a magical moment. Whether open or closed, this unique piece lets girls express their ever after style. 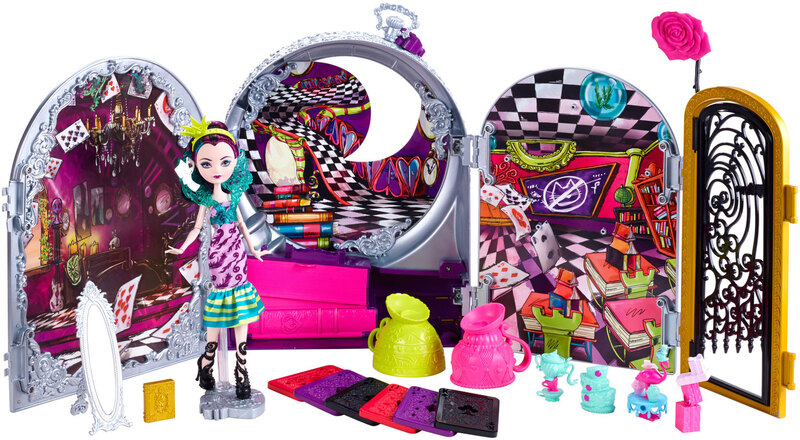 Includes Raven Queen doll wearing fashion and accessories and pocket watch display/play set with six oversized playing cards, two oversized teacups/chairs, one magic mirror, one rose chandelier, teapot and teacups, flamingo treat tray, a birthday cake, presents, doll-sized book and doll stand. Doll cannot stand alone.